Last week I noticed this term, “cultural capital,” in a magazine article about “The Handwritten Heritage of South Africa’s Kitabs”. The subject of this article,”Kitabs,” refers to the Arabic word for “books“. The use of kitabs as a form of “cultural capital,” instantly attracted me. I’ve spent a lifetime involved with some aspect of book-making; as a writer, paper-maker, poet, librarian, book-buyer, editor, book indexer, publishing consultant, an abstractor, a book and magazine reviewer, and a back-of the book index creator. Today with the burning of Notre Dame leaving “a gaping hole in the heart of Paris,” it seems timely to try to define the term “cultural capital”. The word “capital” is a word that has grown to have an extremely narrow connotation when paired with the word economics. While capital includes “labor,”Karl Marx, a 19th century German intellectual, managed to split and alienate labor from capital. The irony is that many economists who abhorred Marx’s analysis, also began to view labor as something separate from capital. Soon with a name change for the field from “political economy” to “economics,” the divorce was finalized. Capital was married to its new wife—money. In the early 20th century, Keynes, the mainsteam liberal economist, created a famous macroeconomic formula that associated Labor with the word “Wages”, while Capital was equated with “investment. Even the budding IRS in the United State separated the two, by calling Wages “earned income” and Capital “passive income”. This split remains to this day with investments being some would say, unfairly, called a “passive” form of wealth. Wages, i.e. earned income, on the other hand, are quite unfairly taxed at much higher rates than investments, with self-employed workers dinged the highest amounts for federal taxes each year. Originally capital meant a kind of outstanding thing, the best of its kind, or excellent. The word capital also refers to cities when they are the political center of our fifty states, the United States, or of other countries. A related word is Capitol, for the government’s building in capital cities. That’s why “cultural capital” leapt out at me. I recognized that there is such a thing, and that it is very important in building community, a sense of belonging, and pride in one’s nation, city, or place of living. The sorrow that many of the world feel for Notre Dame burning in Paris, France yesterday and loss of other forms of cultural capital, indicate that cultural capital is a priceless commodity. We should be giving cultural capital an important place in our studies of economics and society—in ways that cannot be measured merely in terms of money. Cultural capital is what centuries of labor exerted by workers combined with money spent by richer patrons have created for those who created it and for us. It is our collective legacy. Those of us living in the present inherit it from largely unknown ancestors. In this era we are too are now creating outstanding cultural capital in the form of amazing and sometimes destructive technologies that we will bequeath to those after we are gone. When I was fourteen my mother convinced my father to give up his family fishing trips to northern Canada and take us to see Washington, D.C., the Capitol City of the United States. It was time she said, for me to see more of the world. We went via George Washington’s Mount Vernon, a plantation-style home whose British gardens and interior seemed too manicured and boring to me. Then we drove to Thomas Jefferson’s amazing Monticello with its Neoclassical architecture and its gardens filled with passionate, pulsating flowers outside, while inside, the mansion’s practical furniture and abundant inside clearly showed his intellectual bent. Jefferson’s bed is what most caught my eye – I thought he surely must have been a very short person like me to fit into it, but the guide said they slept sitting up in those days. Yet those homes of the first Presidents of the U.S. were just the appetizers. I had no idea of the how much more the main course was going to be a “capital” experience. After my father drove around the roundabouts in The District of Columbia streets fiercely muttering complaints, we finally found a grand building he sought. 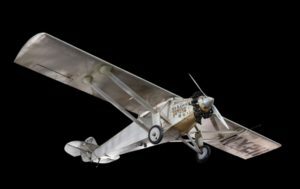 The first thing I saw when we walked into the Smithsonian Museum was a single engine aeroplane hanging for the skylighted roof high over our heads. The plane was called the Spirit of Saint Louis. It was the plane Charles Lindburgh flew solo and non-stop across the Atlantic Ocean in 1927. The second thing I saw shocked me beyond belief. It was a series of photos as we walked upstairs that depicted the stages of a human baby being growing from embryo through birth in its mother’s womb. Later outside, we watched a Shakespeare play under the cherry trees’ pink and white blossoms in the park, saw the Washington Monument, walked to the Jefferson and Lincoln memorials in D.C. After which we found an Ethiopian place where a kind of African bread made out of a fine-grained tan flour called tell served as plates we could actually eat. While I enjoyed our vacations in the Canadian wilderness, our trip to the U.S. Capitol opened my eyes to far more than I’d ever seen before. That included, the most upsetting part of our trip, the Virginia town with the three outhouses on the town square, the third of which said “colored”. This too was part of our American culture back then. Many countries have had cultural capital for far longer than we have. Their cultural capital is often made up of antiquities, art, crafted works, ancient books, pyramids, and plundered items from other countries. In contrast, the Smithsonian Museum in DC is overwhelmingly full of the results of more recent technological advances that the United States has developed. These technologies often surpass the inventions of most other countries. Our cultural capital is largely the product our technology and science—especially the things and ideas developed in the last half of the 20th century when the Russians beat us into space. Along with the categories of capital (as “money”) and labor, we have amassed cultural capital galore in the form of tangible things: public buildings and gardens, patents, copyrights, trademarks, etc., as well as intangible cultural capital in the forms of education, achievements, personal services, and our common values and goals. Unfortunately, money seems to far surpass labor and intangible cultural capital as being deemed things we ought to venerate. Cultural capital exists because of who all of us are and what we do together. In theory cultural capital belongs to every one of us. In practice, it often falls under the moniker of money capital and “intellectual private property,” while labor and cultural capital are ignored as the key purveyors of real wealth and prosperity. Economics will never be whole unless we can all see the bigger picture that cultural capital involves. We’ll never really be safe either until we all seek to preserve and treasure our own and other peoples’ cultural capital. Nancy; These are interesting definitions of “Cultural Capital”. I enjoyed reviewing them. Thanks for sending.